David Sanger is simply the best writer alive working on issues of global and American security, and his latest book proves how far ahead he is of everyone else in his field. His meticulous reporting and cogent analysis of where cyber warfare is headed makes an urgent argument for international standards (a "digital Geneva Convention" is mentioned) to be discussed and adopted with haste. From the Iranian centrifuge sabotage to Russian hacking of Ukrainian power systems and American election tampering, Sanger exposes how little-understood these new capabilities are, and makes a powerful case that this confusion could lead us to a very dangerous place. 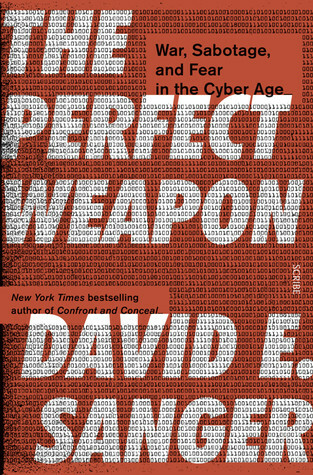 THE PERFECT WEAPON is a gripping, insightful read that I can't recommend enough. This is an excellent and terrifying read. The Russians and Chinese and North Koreans are in the house and it seems that this administration is not at all aware of the magnitude of the threat. Sanger has a lot of access and a depth of knowledge on the issues and this history. He's also an excellent writer. I do have some critiques--he seems to think that the olympic games project where the US and Israel hacked into the Iranian computer networks was completely justified (though he worries about its effects). I'm not so sure. Seems a bit sanctimonious to say--when we did it, it was totally responsible and justified. Now that everyone else is doing it, it's not. As a daily reader of The Times I already had some familiarity with the topics covered in Mr. Sanger's book. However, that reading did not prepare me for what I learned from the depth of research and clarity of writing presented by Mr. Sanger in each chapter. And it's all here: Iran's nuclear centrifuges blowing up; North Korean missiles falling out of the sky; China's remarkable and frightening rise of power in cyberspace; the Russian influence in the 2016 election; and a United States president that is utterly clueless in regard to cybersecurity but still able to spout utter nonsense when asked to discuss our current cyberage. The fear (or fears) are first: most Americans, including myself, are blissfully unaware of the ongoing war until we're struck by the "digital equivalent of shrapnel" that inflicts permanent damage on our lives. The second fear: the knowledge that there is a subset of Americans actively and gleefully, consciously and unconsciously, aiding and abetting the same cyberwar enemies that our country is fighting against. This is a must read book in my opinion. I also recommend checking out: Lights Out-A Cyberattack, A Nation Unprepared, Surviving the Aftermath by Ted Koppel; LikeWar-The Weaponization of Social Media by PW Singer and ET Brooking; and Click Here to Kill Everybody-Security and Survival in a Hyper-Connected World by Bruce Schreiner. Nice summary of current situation around cyberwar from an American perspective. This is a scary world where large state players (China and Russia, but also North Korea and Iran) are increasingly intruding (attacking?) US targets. The US is largely unprotected from a cyberattack, which could take down power, water etc. relatively easily. Having read this it's really unclear how secure US voting systems are from an attack during 2018 election cycle. Well worth a read. A nice complement to Russian Roulette which covers some of the same material as it relates to Russia's hacking of the 2016 US Elections. This book consists largely of the retelling of cyber attack incidents that have previously been in the news over the past ten years. However, the retelling in this book at this time has the advantage of hindsight which provides the enabling perspective regarding background, motive and attribution that were largely uncertain when the stories were first reported. Additionally, encompassing all these stories into one book at this time allows the pondering of their ramifications on privacy, crime, and international relations. affairs, and the ripple effects they had on subsequent relations between tech companies and nation states. The author covered these stories as an investigative reporter for the New York Times at the time when they were first in the news. Thus, he is able to retell these stories by frequently switching into first-person voice while recounting interviews with the individuals affected by the incident.
. They allow a degree of anonymity and stealth in their use while at the same time holding large swaths of nation-state infrastructure and private-sector infrastructure at risk. Additionally, rogue nations such as North Korea have been able to use cyber tools to make money by illegally hacking into electronic bank transfers (e.g. Cyber conflict has the additional complication for governments and businesses because of their unwillingness to admit victimhood or participation in such action. Cyber damage not only hurts reputations, going public can reveal techniques and tools that are best kept secret. Another complication is that even though national interests are involved, many of the tools and technologies involved are controlled by private companies who are marketing their products worldwide and thus prefer to appear independent of their home country. Below are some excerpts from the book involving stories that I found interesting. The first excerpt is an example of how antiquated technology can be advantageous. The second excerpt is an example of the gullibility of Americans. The following describes some of the early Russian cyber-meddling in American political discourse, and their surprise at their own effectiveness—and American gullibility.